There has been no shortage of great college football players produced by our Triangle schools, but no one had ever become a Heisman Trophy finalist until Monday night. 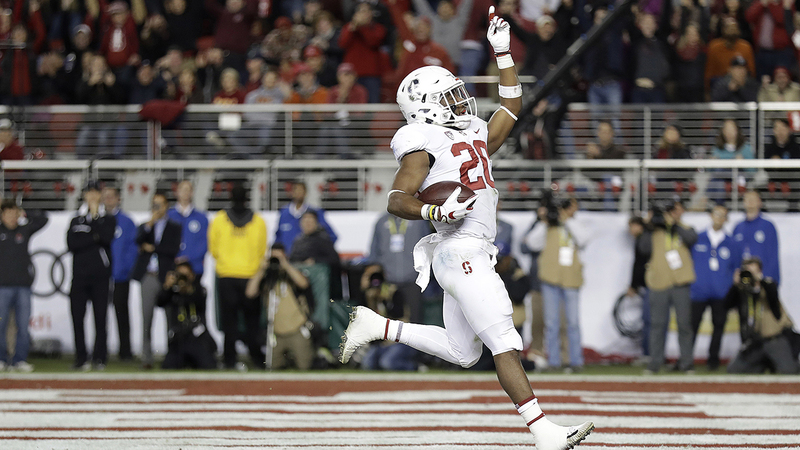 Bryce Love has set the new standard for accomplishment. He may play for Stanford, but he's a local product through and through. A track prodigy turned football superstar with feet made of flames. Bryce waited his turn behind fellow phenom Christian McCaffrey in Palo Alto - and while everyone knew he was talented, I'm not sure even his family foresaw the kind of electric dominance Love would unveil once given the role as the Cardinal's feature back: 1,973 yards rushing and 17 TDs on just 237 carries, an astounding average of 8.3 yards per carry. His 12 rushes of 50 or more yards is an FBS record. Factor in a full class load as a human biology major, at Stanford no less, and the fact that he was banged up with an ankle injury down the stretch and Love's accomplishments become even more impressive. I did my first story with Bryce back in the summer of 2009, when he was a sprinting prodigy, the national age group record holder in the 100, 200 and 400m dashes. His 200m record has since been bested, but he's still the man at 100 and 400. Bryce's secret then? Skittles. He was shy, with a mouth full of braces and most amazingly, didn't know how to do Usain Bolt's famous victory celebration. 2009: ABC11 caught up with Bryce Love as a young sprinting prodigy. Four years later, I caught up with him again. He was older, bigger and just as fast. Football had become his primary pursuit by then at Wake Forest High School. Skittles still had a place in his heart. In 2013, Bryce Love was a threat to go the distance any time for Wake Forest High School. Love would wind up choosing Stanford, an almost impossibly good opportunity for someone with his combination of brains and blaze. Raw video: Wake Forest star Bryce Love chooses Stanford. Now, in 2017, Love has made local history. He may not have an NFL career the likes of Julius Peppers, Philip Rivers or Torry Holt. But none of those guys can boast of being a Heisman Trophy finalist. Love will almost certainly watch Oklahoma QB Baker Mayfield win the Heisman on Saturday night, but just being there is momentous in its own right.